A few weeks ago, we tried a little experiment. 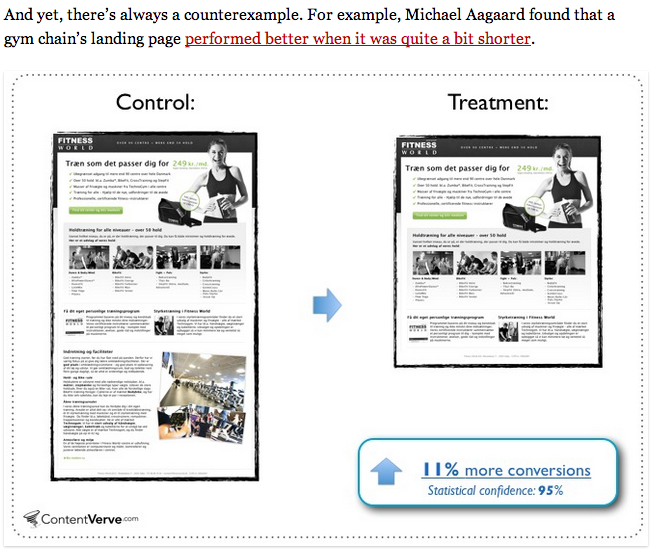 For us, that small test shaped a new way of thinking about what makes content effective. Everyone has opinions. Especially on the internet. Want yours to stand out? Give people a reason to believe you. While a story can make your post more persuasive and memorable, data can often accomplish the same thing. In fact, while a few studies have found differing outcomes, one study published in Communication Research found that a whole week after reading, passages with statistics were more persuasive than passages driven by story. It’s obvious that there’s no single right way to deliver content, and that’s why it’s so important to know why and how different approaches might work, and test to see what works for you. Below, you’ll find four ways to create research-backed content that persuades your readers. What that means is that statistics are a great way to make weak—or flat-out wrong—arguments seem stronger. Like any powerful persuasive tool, use research with your audience’s best interest —and not just clicks—in mind. IF you have something to share that is already valuable and interesting, that’s when taking the time to do your research can make your content stand out and make people take action. If you’re trying to make a point about something that’s been discussed before, there’s a good chance that there’s a research study to back your argument. 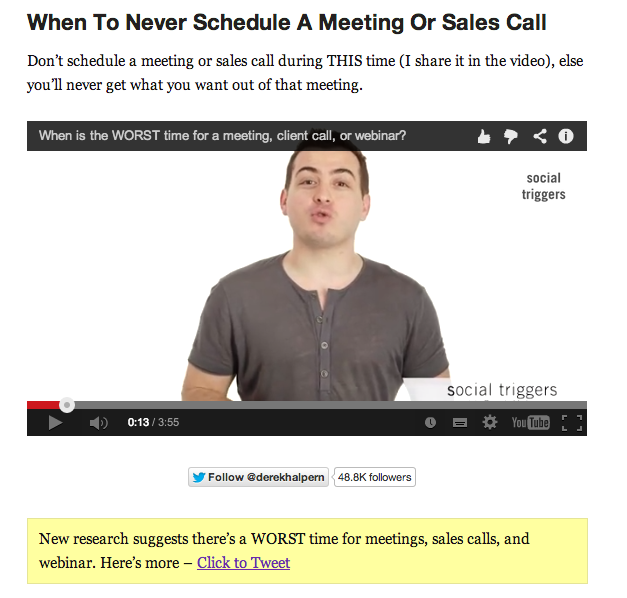 In this video post from Derek Halpern of Social Triggers, he makes a case for the worst time to schedule a meeting or webinar (hint: it’s probably not what you think). But he doesn’t just tell us the wrong time. He shares a fascinating study from Stanford and Ben Gurion University researchers that illustrates his point in a much more compelling way than simply telling us would. The more you filter your search, the better your results become. There’s also Google itself, where searching for ([topic] + “study”) can yield some fantastic results, and Google’s research-heavy offshoot, Google Scholar. Instead of asking your readers to believe you, why not cite someone you already know they trust deeply? When he wrote about how Buffer stopped measuring the direct ROI of social media on this very blog, Kevan Lee made the case that social media ROI isn’t the best direct benchmark for social. 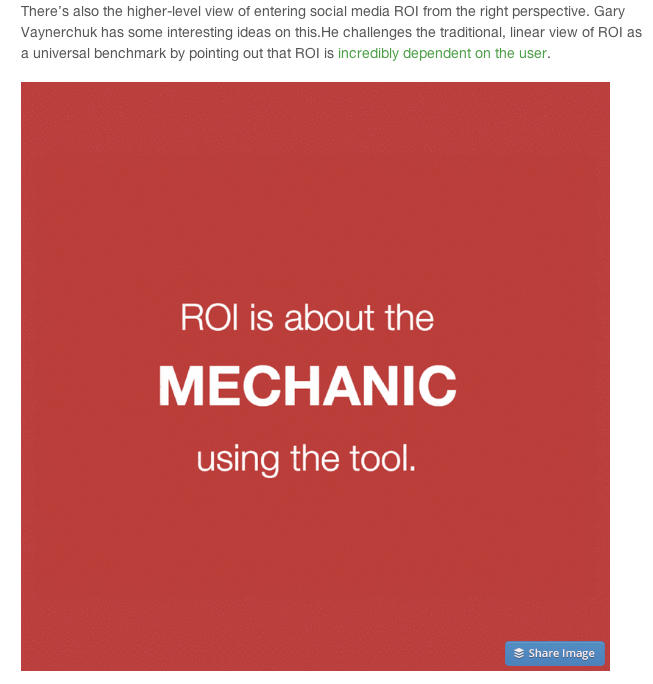 But he doesn’t just ask us to take his word from it; he cites Gary Vaynerchuk, one of the godfathers of social media marketing, and the argument that Gary makes about relative ROI. Where to find quotes from authoritative sources: Again, Google is our friend here. 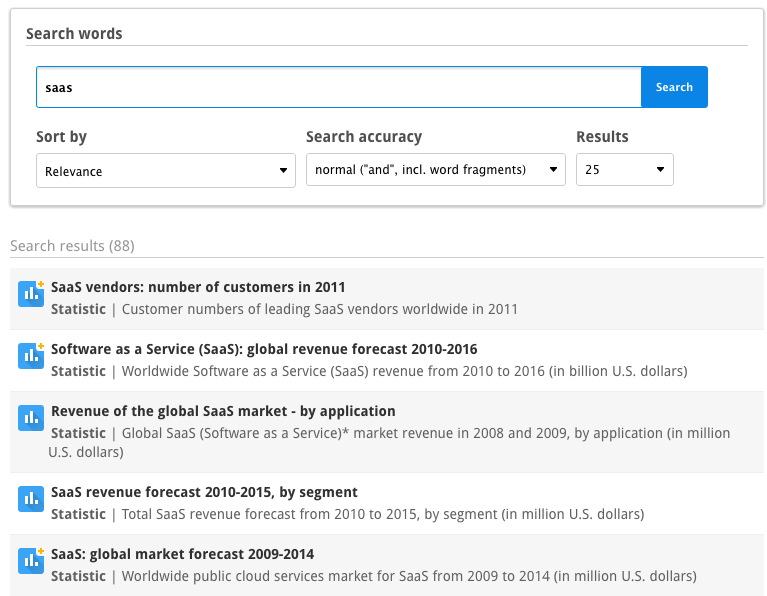 Simply search for the influencer you want to cite, and use additional keywords to maximize your chances of finding a quote. For example, you could search “Vaynerchuk says” for others who have quoted Gary. There’s also the simplest (and arguably best) method of all: simply reach out and ask the person for a quote. You’d be surprised at how many super-busy influencers would be happy to help you. And as a bonus, you’re building high-value relationships — it’s a win/win! This is something that we do a lot at Groove. Because Groove’s blog is about our own growth journey as a business, we use our own metrics and data to tell our story. When we wrote about the ROI of blogging, we didn’t just say that the ROI was positive, or that we made money from the blog. 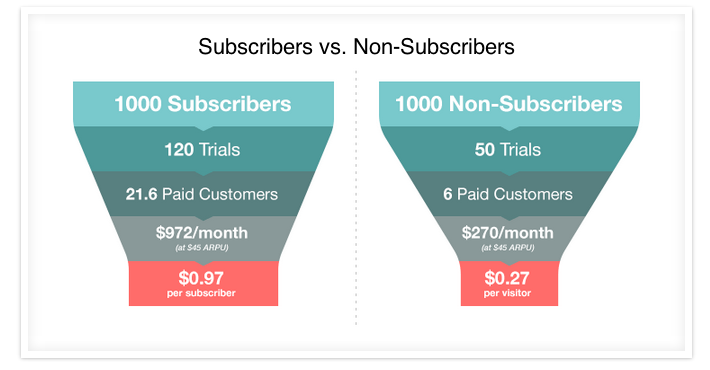 We bared our data to the world and showed how blog subscribers stacked up against non-subscribers. Where to find your own data: Depending on what you’re tracking, there are a number of tools for the job. For analytics, we use a combination of Google Analytics and KISSmetrics. For email metrics, we use Campaign Monitor. For blog outreach and other marketing data, we use things as simple as Google Spreadsheets. The most important thing isn’t the tool; it’s the foundational commitment to tracking everything that’ll arm you with loads of research when you need it. So, you don’t have your own data, can’t find a quote from an authority, and haven’t been able to track down any peer-reviewed research. Do you have any other options? There are hundreds of companies sharing their own data in blog posts around the web, and they would love for you to use it in your content. Which is fantastic, because that data will help you make your point stronger. In Pratik Dholakiya’s post on ConversionXL exploring long-form versus short-form landing pages, he cites data from a number of other blogs’ posts to great effect. Where to find someone else’s data: If you read a lot of blog posts, you undoubtedly stumble on a lot of data-backed posts. I’ve found that the easiest way to leverage this is to bookmark them as soon as I read them. You could use a service like delicio.us, or do what I do and simply organize your bookmarks into folders. For example, when I come across a post with some great conversion data, I put it into my “Conversion Research” folder. Then when I’m writing a post like this one, I can just refer back to it, and the content is right there. To get started, you can bookmark this post! Data and research can make your argument stronger, build your credibility with your readers and create more memorable content. Of course, it isn’t enough. Your posts still have to be interesting, actionable and useful. But by backing your content with research, you can turn awesome content into awesome, credible content that persuades your readers take action.